Do you predict you’re going to need to move your crane rental around a lot on your next job site? If so, a mobile crane will provide you with the flexibility you’ll need to move your crane from one spot to another in a short amount of time. The setup associated with a mobile crane is minimal and will make life easier on you. There are also several other benefits of utilizing mobile cranes. Read about them for yourself below. Mobile cranes won’t take up much space. If space is a concern on your next job site, a mobile crane is the right option for you. Mobile cranes take up very little space compared to other cranes. Additionally, you can move a mobile crane on and off your job site quickly if you need to free up space at any time. They can be replaced right away if you ever experience a problem with one. In the event your mobile crane exhibits any problems, replacing it with a new one that works properly won’t be an issue. You won’t have to worry about disassembling your current crane and then assembling a new crane, which will cut down on the time lost during a project. It’ll typically only take a few hours to send a new mobile crane to your location to replace the one that’s not working. They’re strong and have the ability to pick up almost anything. You might think you need to sacrifice strength to use a mobile crane. But that simply isn’t true. Mobile cranes are as strong as other cranes and can pick up and move very heavy objects on a job site. You will, of course, need to pay attention to the load restrictions on a mobile crane just like you would need to with any other crane. But a mobile crane will pack the same kind of punch you would expect from other cranes while offering a long list of other benefits. 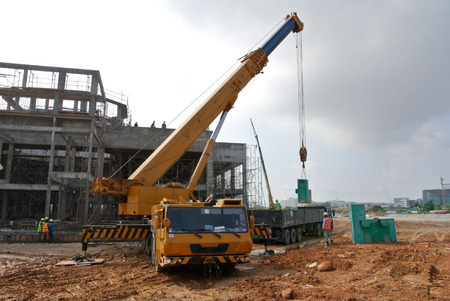 A mobile crane can work wonders for many companies in the construction industry. Call Astro Crane at 978-429-8666 today to ask how a mobile crane might be able to help you.